How do I Convert a Word Into Music? Composing music can be easy or difficult, but often a helpful starting point is to limit your options and compose within strict parameters. Using a single word and turning it into music narrows your options in terms of material (the word) and also instrumentation, as the word will have to be spoken or sung by a person. Through the years, many pieces of music or sections of songs have been based on a single word—an example would be the chorus to "Why" by Scottish singer Annie Lennox. Here the word "why" is repeated melodically over a changing chord sequence. There are many ways to turn a word into music—use your imagination and have fun. Decide whether the word will be sung to a pitch (or several pitches), or whether it will be spoken in an unpitched style. When people sing, the notes they use—which may move upward and/or downward in a melody—are pitches. When people speak or rap, these are unpitched notes. Write down the pitches of the notes you want to use on the musical stave of your manuscript paper. Represent this sound with an "x" instead of a conventional note head on the stave if the notes are to be unpitched. 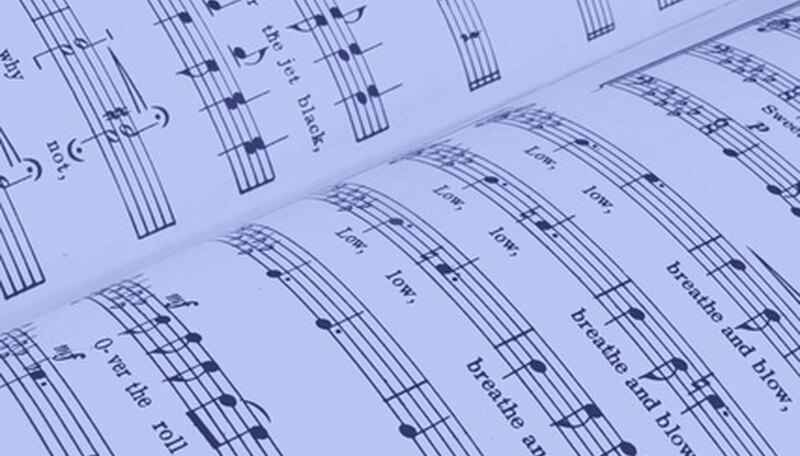 Write the word underneath the pitch, pitches or unpitched note it will be sung with. Make sure that each syllable of the word is lined up directly underneath the note you want it sung with, and if the word is to be repeated, write in these repetitions. Decide how long each note will be held for, with regard to the beat or pulse of the music. This will determine the rhythm value of each note. Draw each note according to the rhythm you want it to be sung or spoken in. Add extra elements if you wish. Change the musical dynamic of your composition by singing or speaking it strongly or softly, or by transitioning from strong to soft. Add accompanying instruments to the spoken or sung part that you have written. Add extra singers or speakers to create harmony if different pitches are used. Add rhythmic counterpoint if the singers are not in unison. Experiment! For words containing the letters between A and G, music can be created by using each letter of the word to correlate to a musical pitch. For example, the word "face" could be translated into music by using the pitched notes F, A, C and E in order.